This 3" tall dragling has had too many martinis, holds an olive in its paws. Available in blue, green, or purple glazed ears and wings. 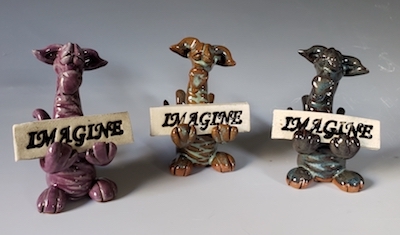 This 4" tall dragling holds an "imagine" sign in his paws. He was inspired by the band called Imagine Dragons. Available in blue, green, or purple. This 4" tall wizard's staff is an incense stick. He holds a ½" glass ball in the other hand. A 6" long clay tray to catch the ashes is included. A sampler pkg. of 20 incense sticks is included. ...is in a bad mood! 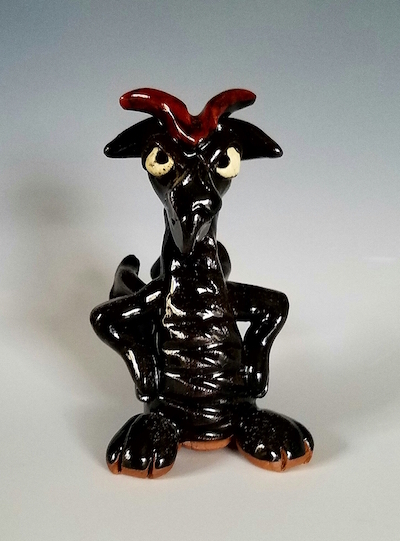 He's 3 ½" tall and glazed with black to match his mood. This 4" tall dragling is saying his pleases and thank yous. He comes in the natural clay with porcelain wings and halo with staining. Burnie loves fire so much that he holds an incense cone between his feet and an incense stick in the curl of his tail. He is available with blue, green, purple or black on his ears and wings. A 10" tray to catch the ash and a pkg. of incense cones and sticks is included. This 4" long dragon sits on a 10" long clay tray. He smokes from a stick incense in his mouth. Available in stained finish only. Includes a pkg. of 20 incense sticks. 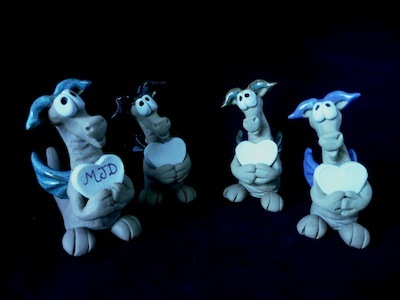 This 4" tall X 5" long pair of kissing draglings are made from white clay with staining. For an additional $5 fee, you can request by phone or e-mail any colors painted onto their ears and wings to coordinate with your wedding cake. Just mail me some samples of your ribbons or stationary. 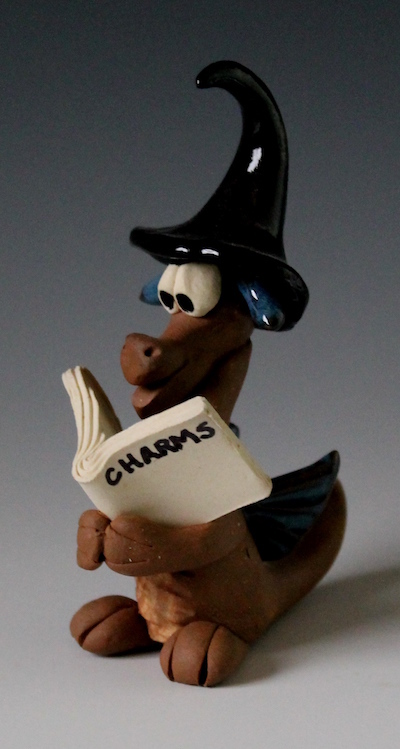 This 5" tall dragling wears a wizard's pointed hat and is reading a spellbook. The hat is navy. The detail on the dragling can be green, blue or purple. 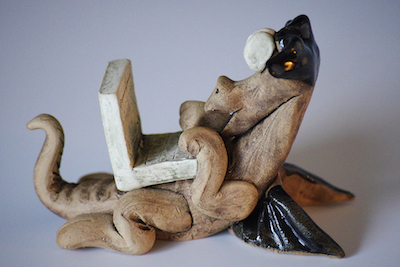 This 5" tall dragling hangs on the wall to hold your keys or jewelry in his curled tail. He is also an Asian symbol of good luck to hang him by a door. Shown in the purple glaze. Also available in blue, green, black, or natural. This clever 4" dragling has an important job - guarding your rings on his tail. Available in blue, green, black and purple. Charity is a remembrance dragling, created in memory of our mothers, Marjorie Davis and Carlita Hogenson. For every one sold, we will donate $20 to the American Cancer Society. Charity's porcelain heart will be blank, so you can personalize it with a fine felt tip marker. He is about 3½" tall. His ears and wings will be blue, black, green, or purple. This dragon is 3" tall and 4" wide. He holds a tiny laptop computer on his belly. Shown in natural clay with black details. Also available with blue, green, or purple details.